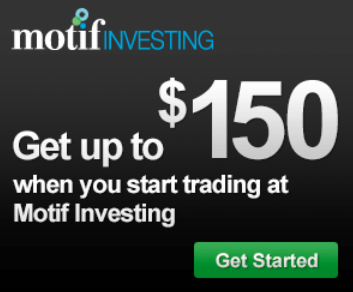 Home > Investing > Motif Investing Review: Get Up To $150 Cash Back! I opened an account with Motif Investing about two years ago, so I thought a Motif Investing Review would be in order to go over how they can help you reach your investing goals. Motif Investing is a rapidly growing player in the online brokerage scene. They’ve been around for five years and bring a new twist to the traditional online investing model – which I’ll get into a little more below. What I really like about Motif Investing is they make it easy to start investing in the stock market. That’s especially the case if you’re investing on a limited budget as they allow you to start investing with as little as $250. Motif was started by former Microsoft Executive, Hardeep Walia, who decided to move into the brokerage industry and from there the brokerage has grown significantly. His vision was to offer a low-cost investment model for those held back due to the high fee nature of the industry. With that bit of background out of the way, let’s move on to the Motif Investing review. What Makes Motif Investing Unique? With Motif Investing you create your own bucket, or motif, of up to 30 stocks or ETFs. Each motif can be traded for $9.95. You should realize that you’ll likely end up with fractional shares but that will be fine for most. What if you don’t want to create your own motif? Motif Investing offers roughly 150 pre-made motifs covering pretty much anything you can think of from equities to fixed income options. Motif Investing also allows the ability to trade individual stocks. True to their low-cost philosophy, Motif charges $4.95 per stock trade which puts them at the same level as TradeKing as the low-cost leaders. The real value with Motif Investing comes from, in my opinion, the ability to take on a specialized focus with your investing. There are thousands of mutual funds and ETFs out there, but that doesn’t guarantee there’ll be a focus you want. The possibilities really are endless if you’re interested in having a specialized focus for a certain part of your portfolio. Motif Investing offers active rebalancing with their pre-made motifs. Since you’ll essentially trade in and out of certain holdings the charge for this is $9.95. Motif allows you to invest in IPOs. IPOs can be incredibly risky, though is something not typically available to many retail investors. Motif has access to any IPOs available through J.P. Morgan. You can invest in IPOs with as little as $250 through Motif Investing. Many other brokers require account values of at least $50,000 to have the same access. That’s not the case with Motif. Motif has recently added a “Trading Alerts” feature as a part of the platform. This really isn’t unique, as many other brokers offer it, though they allow you to set alerts for specific holdings as well as entire motifs – it’s a pretty slick feature that makes Motif a little more robust. What’s Needed to Open an Account With Motif Investing? If you want to open an account with Motif Investing they make it relatively simple. The application process, much like with other brokers, takes maybe 10-15 minutes and is pretty straightforward. I selected the “Taking Flight” motif and am interested to see where it goes. As I mentioned prior, all you need to get started with Motif Investing is $250. Once you fund your account you’re ready to choose a motif. Motif Investing does not offer dividend reinvestment. I know this may be an issue for some. With the amount I started with it really isn’t an issue. Motif does offer a specialized motif that’s focused on high dividend paying stocks that have not cut their dividends in the past ten years. Honestly, it wouldn’t surprise me to see this feature added in the near future especially now that they offer individual stock trades. Motif Investing does not have any hidden or maintenance fees which is great to see. There does come the question of what happens with the pre-made motifs if there is a stock you don’t want in it. You can trade out of that holding, but costs $4.95 per trade out to do so. That’ll be something to look out for in order to make sure you’re not racking up fees. One thing to keep in mind is if you choose a pre-made motif that has several stocks in it you do not want, it’ll be much cheaper to simply create your own motif so as to avoid paying $4.95 to get rid of each stock. If you open a non-IRA account like I did you will want to watch out for tax issues. That goes directly back to the active rebalancing. When you rebalance you will be creating a taxable event. Speaking from my online brokerage days, far too many investors do not take taxes into consideration with their investing. As you really should only rebalance semi-annually or annually the event will happen then, but you’ll want to make sure and speak with your tax advisor if you have any questions. The other thing to look out for with Motif Investing is they do offer access to low cost ETFs. If you’re particularly interested in those, Motif offers their no fee Horizon motifs which groups together best in class low cost ETFs. The Horizon motifs are fully customizable based on your risk tolerance as well as the amount you’re starting with. I think for the right individual Motif Investing can be a great brokerage option to consider. We do the bulk of our investing with Vanguard but I like to have a play account that I can do a little secondary investing in. If you’re looking for a way to invest a small portion of your portfolio, say 5-10 percent, Motif can be a great option to consider. The other group that might do well with Motif Investing are those relatively new to investing as they offer a straightforward and low barrier way of getting started investing. I honestly would like to see some sort of dividend reinvestment option, though that is obviously not holding me back from investing with them. However, I know they’re aware of the desire so would not be surprised to see that in the near future. That being said, if you’re looking for a way to invest in a specific niche or a way to supplement investing you’re already doing then Motif Investing is a solid option to consider. If you do choose to open an account with Motif, keep in mind they do also offer several promotions – including up to $150 cash back for opening a new account. What are your thoughts on this type of investing? Is there a specific niche you’d like to invest in but haven’t had the ability to? Summary : If you're new to investing, Motif Investing offers a great way to get started to help you grow your wealth! Ineteresting! I’ve never invested on anything other than MF’s and stocks. Maybe this is a good way to diversify. I am pretty loyal to Vanguard index funds, but this is an interesting concept. The $150 in free money doesn’t hurt either. I’ve been thinking about trying Motif out. I really like how you can create your own portfolio of stocks based on what you want. I really like how the cost to do this is reasonable and you can search through all everyone else’s motifs and see if they work for you. I had been putting off trying them out for some time Jon and finally decided to pull the trigger and try it out. I really like those aspects as well – and largely what drew me to them. I do largely index funds and a few high dividend payers so it’s fun to use a little play money on something else and work to grow it. What I love about Motif Investing is that it has no Hidden Fees. Fees can be a drag on investing returns and hidden fees are horrid at best. I am able to invest without the fear of getting hit with some sort of random hidden fee. So far so good. Agreed Jayson, I’m not a fan of hidden fees either. I like that Motif Investing doesn’t have any. My only issue with getting the $150 is the $2000 requirement invested to get it. Understood Ginger. The nice thing with the Motif Investing promo though is that it’s one of the lowest barriers to entry in the brokerage industry to get a cash bonus – they usually start at at least $10,000.